Vaccination is one of the most cost-effective and successful public health interventions. Each year, vaccines save an estimated 6 million to 9 million lives worldwide, including the lives of 3 million children. In the United States, vaccinations have decreased most vaccine-preventable childhood diseases by more than 95 percent. Vaccines have minimized or eliminated outbreaks of certain diseases that were once lethal to large numbers of people, including measles and polio in the United States and smallpox worldwide. But because the bacteria and viruses that cause diseases still exist, the public health gains achieved through vaccines can only be maintained by ensuring that vaccination rates remain high enough to prevent outbreaks. Vaccines are effective not only because they protect individuals who have been vaccinated but also because they confer a broader protection for communities by establishing “herd immunity.” When sufficiently high proportion of a population is vaccinated against communicable diseases, the entire population can obtain protection. As the number of vaccinated people in a given population increases, the likelihood that a susceptible person will come into contact with an infected person decreases; it ultimately becomes difficult for a disease to maintain a chain of infection. Although the vaccination rate required to achieve herd immunity varies by vaccine, it typically ranges from 80 percent to 95 percent of a given population. Herd immunity is critical for protecting the health of many groups of people who are especially vulnerable to communicable diseases: those who cannot be vaccinated, either because they are too young or because an immunological condition makes vaccination too risky; those who choose—or whose parents choose for them—not to get vaccinated for nonmedical reasons such as religious or personal beliefs; and those who have been vaccinated but whose immunological response is insufficient to protect them from potential infection. Because children are especially vulnerable to certain diseases and because vaccines help the body to develop disease immunity over time, many vaccines are most effective when administered to children at a young age and based on a recommended immunization schedule. A significant number of children in the United States, however, do not receive the fully recommended schedule of vaccinations. These children fall into two broad categories: the unvaccinated, who do not receive any immunizations, and the undervaccinated, who do not receive the fully recommended vaccine schedule. Unvaccinated and undervaccinated children are socioeconomically and demographically distinct populations, and separate factors account for why they are not fully vaccinated;. Generally, children tend to be unvaccinated due to their parents’ decision to take advantage of vaccine exemptions, whereas many children are undervaccinated because of barriers to access, such as poverty and the cost of vaccines. Although all states have vaccination mandates for schoolchildren, in recent years they have granted a growing number of nonmedical exemptions. As a result, the risk of infectious disease outbreaks—especially among children—has increased. Clusters of exemptions have cropped up in certain communities, eliminating those communities’ herd immunity and leading to outbreaks of vaccine-preventable diseases. While the issues of nonvaccination and undervaccination must be addressed to protect children and their communities from significant health risks, this brief focuses solely on children who are not immunized due to parents’ use of nonmedical vaccine exemptions. 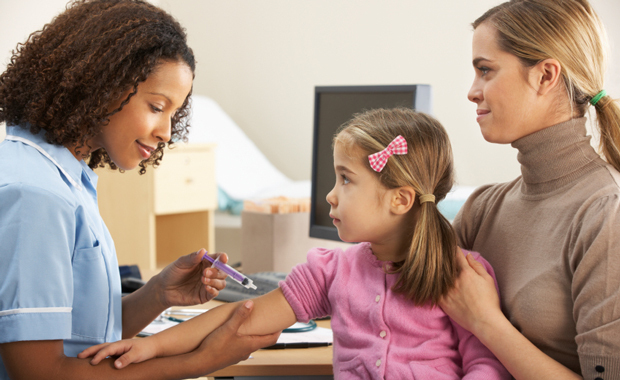 We survey the research on state childhood vaccination mandates and exemption categories, focusing on the role that nonmedical exemptions play in reducing immunization coverage in communities throughout the United States. After reviewing the evidence, we suggest possible responses at the state and federal levels. All states currently require children older than age 5 who attend public school or state-licensed day care facilities to receive a series of vaccinations prior to enrollment, though these requirements vary in terms of the number of vaccines required and the school grades covered. While vaccination mandates exist for certain groups of adults, such as military personnel, employees of certain health care facilities, and immigrants who are seeking permanent residence in the United States, the majority of vaccine mandates apply to children. Although all state school immunization laws grant medical exemptions for children who are susceptible to adverse effects from vaccination, states have different policies regarding nonmedical exemptions. Every state except Mississippi and West Virginia grants some kind of religious exemption, while 17 states allow for“personal belief ” or philosophical exemptions. In addition, the administrative procedures for obtaining nonmedical exemptions are much more lenient in some states than in others. Some states require that parents renew their exemption annually, obtain a signature from a local health department official, notarize their exemption form, or write a personal letter explaining their reasons for refusing vaccination. In other states, however, it is much easier to procure an exemption. In Maryland, for example, as of 2006, parents could obtain a religious exemption simply by signing and submitting a prewritten form. According to one study, in 23 states, school officials were not even authorized to deny exemption requests if the requests fulfilled state requirements. In practice—because much of the responsibility for enforcing exemption laws falls on school officials—there are additional within-state variations in the types of exemptions granted and the processes for approving exemptions. For example, one study found that even in Massachusetts and Missouri, two states that do not allow for personal-belief exemptions, 18.1 percent and 17.0 percent of schools, respectively, permitted personal-belief exemptions anyway. Administrative procedures can also vary within states. Michigan, for example, has no standard statewide process for granting exemptions. Even among states that do have statewide exemption procedures, there is significant variation in how those policies are enforced at the school level. In recent years, there has been an increase in state-level rates of nonmedical exemptions from vaccination mandates for schoolchildren. Nationwide, the ratio of nonmedical exemptions to state vaccination mandates still remains relatively low, but between 1991 and 2004, the mean state-level rate increased from 0.98 percent to 1.48 percent. Perhaps more significantly, clusters of exemptions have emerged in individual communities, eliminating those communities’ herd immunity and increasing their risk of experiencing an outbreak. In the community of Ashland, Oregon, for example, the vaccination exemption rate for schoolchildren during the 2001-02 school year was 11 percent, compared with a rate of 2.7 percent for the entire state and 3 percent nationwide. These exemption clusters are dangerous because if enough individuals within a particular community receive exemptions, then the community will lose its herd immunity. In turn, this loss of immunity increases the risk of infection not only for other exemptors—both nonmedical and medical—but also for some individuals who have been vaccinated since no vaccine is 100 percent effective. There are a number of factors that have influenced the rise in nonmedical exemptions. To some degree, vaccines are victims of their own success; they have reduced the incidence of vaccine-preventable diseases so much that a growing number of people are less concerned about contracting them. At the same time, public concern about the real or perceived adverse health effects from vaccines has increased. But one important part of the explanation for the rise in nonmedical exemptions lies in the ways that states have constructed exemptions to their vaccination mandates. More specifically, research shows that the states that grant philosophical exemptions or make it easy to apply for exemptions have greater numbers of nonmedical exemptions. In every state for which the Centers for Disease Control and Prevention, or CDC, had data on vaccination rates for children enrolled in kindergarten from 2009 to 2010, the number of philosophical exemptions exceeded the number of religious exemptions. One study estimated that from 2005 to 2011, the rates of nonmedical exemptions in states that allowed philosophical exemptions were 2.5 times higher than in states that only allowed religious exemptions. The rates of exemptions in states with easy exemption policies were 2.3 times higher than in states with rigorous exemption policies. Recent studies, however, suggest that states that only have religious exemptions or moderate or difficult administrative processes may be catching up. In recent years, the growth rate of exemptions in those states outpaced that of states with philosophical exemptions or lenient application procedures. This rise in nonmedical exemptions has contributed to recent outbreaks and increased rates of vaccine-preventable diseases, such as measles, pertussis, and whooping cough. In 2008, for example, the CDC reported 131 cases of measles in the United States—more than double the yearly average from 2000 to 2007. According to the CDC, “This increase was not the result of a greater number of imported cases, but was the result of greater viral transmission after importation into the United States.” The cases occurred “largely among school-aged children who were eligible for vaccination but whose parents chose not to have them vaccinated.” A study published in the Journal of the American Medical Association, or JAMA, supports the CDC’s conclusion, finding that children who have been exempted from vaccination requirements were 35 times more likely to contract measles than vaccinated children. Another study found that exemptors were more than 22 times as likely to contract measles. At the same time, pertussis—a disease that was once considered “doomed by science”—has enjoyed a renaissance. The CDC reports that there were more provisional cases reported in 2012 than in any previous year since 1955, and that 49 states and Washington, D.C., reported a rise in reported cases compared to the previous year. In 2010, a pertussis outbreak in California led to the hospitalization of 455 infants and 10 deaths; in 2012, both Washington state and Minnesota reported pertussis epidemics. Some of this resurgence may be attributable to other factors, such as the acellular pertussis vaccine’s diminished long-term effectiveness. But there is a substantial body of research showing that the growth of nonmedical exemptions—itself driven in part by philosophical exemptions and lax exemption procedures—has contributed to an increase in the overall incidence of pertussis and a rise in the risk of pertussis outbreaks in specific communities. Another JAMA study, for example, reports that the incidence of pertussis was more than twice as high in states that allow personal-belief exemptions as in states with only religious exemptions, and that states with easy exemption procedures had a incidence of pertussis that was 90 percent higher than states with difficult procedures. Another group of researchers conducted a study of children in Colorado and found that exemptors were nearly six times more likely to contract pertussis. The impact of nonmedical exemptions has been particularly acute in specific communities where relatively high proportions, or “clusters,” of individuals utilized available exemptions. One study found that pockets of high exemption rates exist in Michigan despite its high overall state-level rate of vaccination and that those census tracts with clusters of nonmedical exemptions are three times more likely to have pertussis outbreaks. Another study recently examined rates of religious exemptions in New York state over time and concluded that counties with higher exemption rates had higher rates of reported pertussis compared to low-exemption counties. The evidence that states with personal-belief exemptions or easy exemption procedures have more nonmedical exemptions and a greater incidence of communicable diseases suggests that modifying these exemption laws would help prevent future outbreaks. States must take primary responsibility for restructuring their vaccine-exemption laws. One potential reform is for states to eliminate personal-belief exemptions since there is no constitutional requirement for them to grant such exemptions. Eliminating personal-belief exemptions would not affect religious exemptors or individuals with strongly held secular objections. But it could still significantly reduce exemption rates, as there is evidence that many personal-belief exemptions are actually “exemptions of convenience”—meaning that individuals apply for personal-belief exemptions simply because it is easier than fulfilling vaccination requirements. States could also redesign their exemption-application procedures to ensure that exemptors think more deliberately about their decision. Several states have already started moving in this direction. The Oregon legislature, for example, recently passed a bill requiring that parents demonstrate that they have consulted a physician or watched an online educational video about the risks and benefits of vaccination before sending their unvaccinated children to school. Vermont passed a similar law in 2012, and Washington state passed one in 2011. As with eliminating philosophical exemptions, making exemption procedures more rigorous would not deter those with deeply held convictions against vaccination. But because many exemptions are exemptions of convenience, even minimal administrative requirements have significant impacts on exemption rates. To further prevent clusters of vaccine exemptions from forming, state health authorities could do more to monitor and publicize the number of nonmedical exemptions at the county level and focus their education and outreach efforts on counties with exemption clusters. State authorities could also implement uniform statewide processes for granting exemptions and review school exemption policies to ensure that they comply with state law. The federal government should also support state efforts. The CDC, for example, could publish a model exemption law as a guide for states interested in strengthening their exemption policies. In tandem with state efforts, the CDC could also collect and publicize county-level exemption data, perhaps by publishing a list of those counties with the highest exemption rates and estimating their increased risk of experiencing a disease outbreak. The CDC could help school officials to provide information on school and countywide vaccine-exemption rates to parents so that they are informed about the level of immunization at their children’s school. Making this data more transparent and accessible to the public may encourage states or counties with lax vaccine policies to re-examine current laws. It may also foster an understanding among parents that vaccination is important. Private health insurers could also encourage enrollees to receive cost-free immunizations against preventable diseases by offering premium rebates to individuals who complete their vaccination schedules on time. At a minimum, insurers should send informational materials and reminders to patients about vaccine schedules. In designing vaccine mandates, governing institutions must balance latitude for individuals to make decisions about their own health and the health of their children with protecting the safety and well-being of the public. Vaccines have the capacity to dramatically improve public health, and an individual’s refusal to get vaccinated increases the risk of infection for his or her entire community, including those infants and individuals with medical conditions who do not have the option to receive vaccination. Governments must therefore ensure that individuals who opt out of immunization are informed of the potential consequences of their decision. While more must be done to address other barriers to childhood vaccination, such as the cost and supply of vaccines, the initiatives outlined here are critical steps in addressing a major barrier to effective immunization: excessive parental use of nonmedical exemptions. Emily Oshima Lee is a Policy Analyst with the Health Policy team at the Center for American Progress. Lindsay Rosenthal was a research assistant for Women’s Health and Rights and Health Policy at the Center. Gabriel Scheffler was a Ford Foundation fellow with the Health Policy team at the Center.